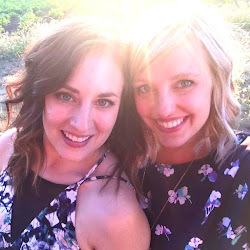 Where: 1401 SE Morrison St.
Nostrana's 9pm happy hour features thin crust pizzas, a charcuterie board, salad, mac and cheese, and wood-fired ciabatta. I haven't covered the entire menu yet, but so far everything I've ordered has been great! It doesn't hurt to know you're in good hands with Nostrana's Chef Cathy Whims who has been named a finalist for the James Beard Foundation Award in the category of Best Chef: Northwest. This is her third consecutive nomination so I think she knows what she's doing! During both visits to Nostrana, my group has ordered a few things to share, my favorite way to do hh. Dana, Katie and I shared the Pizza Margherita ($6) which tasted so fresh with tomato sauce, basil and a house mozzarella. The pizzas arrive uncut with scissors, or "pizza sheers" as Adam liked to refer to them, to cut your slices. This is a fun way to serve this thin crust delight, and can result in nice triangle slices or unpredictable shapes. We also attempted to order the Pizza Marinara ($5) with tomato, garlic and wild oregano, but our waiter ordered us another Pizza Margherita. Reason to go back I guess? You know I can't resist a hh mac and cheese so we shared the Mac & Cheese ($6) featuring penne, five cheeses, tomato, and cream. It was baked so the top was a little crispy, but it was also creamy and hot which are two important stipulations for good mac. Off the HH drink menu, Katie and I ordered the Gin & House Tonic ($5), while Dana opted for the Campari & Soda ($5). I really enjoyed our drinks. The tonic isn't super sweet like some can be, and with a little lime it's totally enjoyable. During my second visit with Adam and his brother, we ordered two Pizza Margheritas to share. We thought we might be full and take some home, but that didn't happen. Too good! Our waitress was a little confused so it took some time to get all of our orders, but finally we got the Charcuterie ($5) with salami, prosciutto, baby pickles, bread and spicy mustard. I'm not sure if their meats vary, but I would recommend this! Apparently we were doing a little carb loading because we also ordered the Wood Oven Ciabatta ($3) which was really tasty. Sometimes you just can't beat really good bread and a little olive oil. 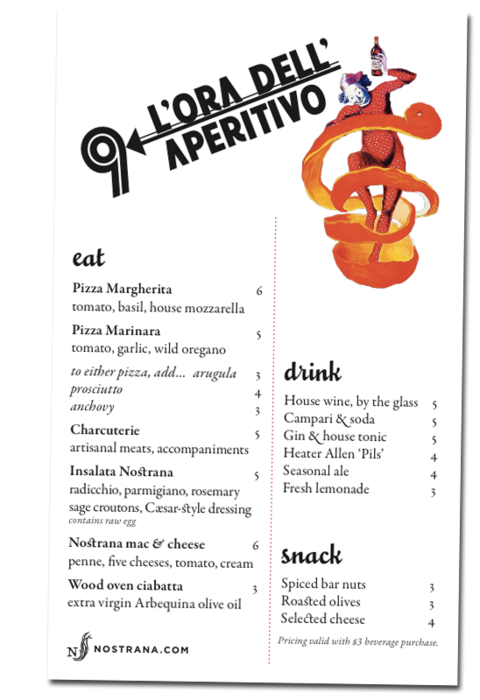 I definitely want to try the other pizza and the Insalata Nostrana ($5) in my next visit. There's also the option to add arugula, prosciutto, or anchovy to either pizza...I would go with prosciutto! 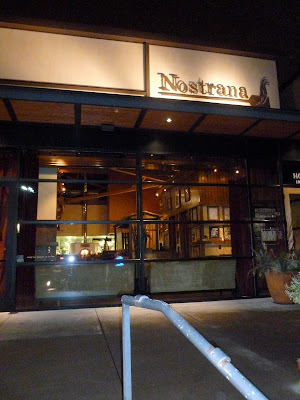 And a Quick Addition from Katie: I tried the Insalata Nostrana, Nostrana's version of a caesar salad, the next two times I visited, and I hope to have it again very soon. Those rosemary croutons are kind of amazing. I also ordered the Salumi Pizza ($15) with dry salami, tomato, provolone, house mozzarella, wild oregano, and honey. It's not on the happy hour menu, but it was definitely worth paying full price. The combination of savory salami with the sweet honey was so unexpected but so delicious.